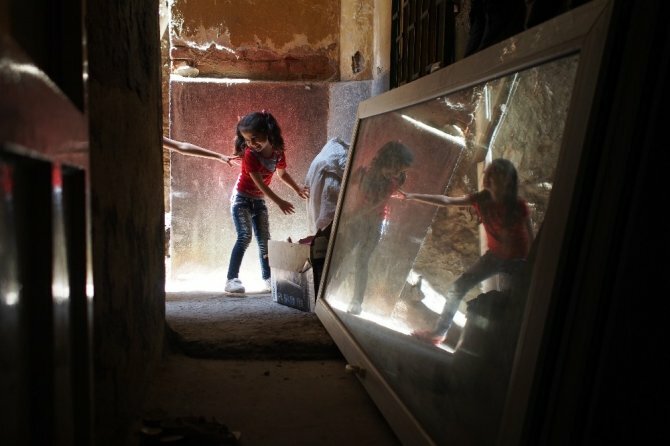 “When you enter a refugee family’s home, you immediately understand what their future plans are,” said Sinan Kılıç, a photographer who has been working on documentaries of refugees and migrants for the last five years. Two Syrian families, the Salmans and the Askans, who Kılıç and his colleague Serkan Çolak photographed for their last project “Starting a New Life,” are the perfect examples of this. The Salman and Askan families have arrived here in Turkey more or less around the same time, at the beginning of the Syrian war. Neighbors at the Basmane district, the old city center of İzmir, one of the two is determined to stay and the other is desperate to leave Turkey one day, not for some European country as many would suppose but for Damascus, where they lived before. “What we wanted to do was to show their lives as they are, with its happy and difficult moments, without dramatizing it,” Kılıç said. “Serkan and I have been living in Basmane ourselves, and we have known the photographed families – two Syrians and one Afghan – for three years now. We have a relationship of trust and that is why they allowed the two of us, as well as the 12 photographers we worked with in this project, to enter into their private space. Of course, they had the final say in what we could use,” he added. The project aims to combat the prejudices and the hate speech refugees in Turkey are exposed to in general and particularly in İzmir, Turkey’s third largest city, which hosts 103,000 Syrian refugees, making it 2.5 percent of the city’s entire population. Following Turkey’s deal with the European Union, the orange life jackets on the streets have been replaced by signposts in Arabic: many of the refugees came to the realization that the old town of İzmir was no longer a pit-stop before they take their fatal journey, it would be home. Teodora Hacudi, who works at the province’s Konak Municipality dealing with questions of integration, maintains at the opening of the “Starting a New Life in Basmane” exhibition, where photos on the wall show a life better than many of the refugees lives. Hacudi, an activist who does not mince her words at the heart of Basmane, fumes with anger about the myths and hate speech stigmatized around the refugees. “There are all sorts of statements in the city that Syrian refugees are getting as high as 1,500TL per month or that Syrian students can get admitted to universities of their choice. When I look around, all I see are families who are living under terrible conditions, school-age children having difficulty enrolling in schools and even more difficulty integrating, or children who go to school during the day and to sweatshops to work during the night. What I also see in the resentment of Turks is that they are fed with myths and untruths,” Hacudi said. The myths about the Syrians, from free education to free tax on certain goods, may be myths, but their effects are very real. Online fact-checking website “Doğruluk Payı” (Share of Truth) has made several reports on the grounds that 1,200TL of education support to Syrian refugees were limited to a small group only and that the fact that Syrian youth could enter Turkish universities without sitting exams and Syrians would live rent-free in public housing (TOKI) buildings were complete myths, but the public received very little of the share of the truth. A concrete effect of the myths is that Syrian families have to pay higher rent than their Turkish neighbors for tattered houses. Hacudi said the recent photo that went viral on the internet, where a Turkish employer is seen stepping on a Syrian worker’s stomach, with the caption “A Turk’s revenge on a Syrian,” shows the humiliation inflicted on Syrians. “There is a lot of violence and abuse – economic, physical and social,” she said. The man, who claimed that the photo had been a joke, has been detained and sent to court with a demand for his arrest in İzmir.